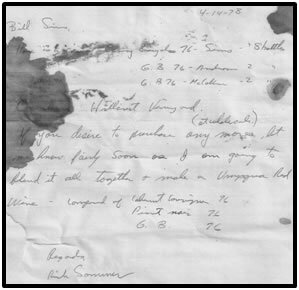 Bill Sims was an electrical contractor (Sims Electric) in Roseburg, Oregon. He was a founding member of the Oregon Wine Growers Association which was established in Roseburg in the mid to late 1960’s. 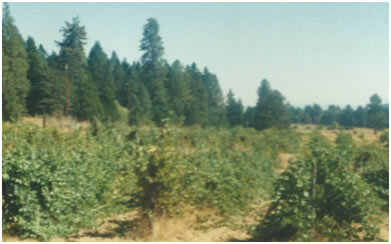 In the late 1960’s Sims had acquired a parcel of land adjacent to Doerner Ranch land not far from the city of Roseburg. Over a two year period in around 1969 he planted three acres using cuttings acquired from Concannon Vineyards in California. He planted Pinot Noir, Gamay Chennin Blanc, and Pinot Blanc. A small number of other Roseburg residents, including physician Dr. Verner Anderson and Scott Henry (Henry’s Estate) planted vineyards about this time. Sims soon found that it was not easy finding buyers for the small quantity of grapes produced. His production ranged from 1½ - 6 tons per year most of which was Pinot Noir. He initially sold to Hillcrest Vineyards until they could no longer handle small quantities. Other buyers were Giriadet, Davidson, Forgeron and Callahan Ridge. Sims continued farming the vineyard until it was sold in the mid 2000’s.